Tag Archive | "Yo-Yo Loach (Botia almorhae)"
The Yo-Yo Loach (Botia almorhae) is also known to tropical fish keeping enthusiasts as the Pakistani Loach, Reticulated Loach, Y-Loach and Almora Loach. Although it is named for the district (Almora), Uttarakhand State, India where it is found, it is also called the Pakistani Loach, which is actually a misnomer, since it is restricted to parts of the Ganges River drainage in northern India, and possibly Nepal. They are found in India, Nepal, and Bangladesh. Specimens collected from Pakistan are generally a darker color than the India varieties and local color variations are common. The Yo-Yo Loach is an active, playful fish that is also a great scavenger in a community aquarium. They are found in the rivers and slow moving highland streams of their range where they tend to congregate in pools and still water areas around rocky substrates. Prior to spawning, they migrate upstream. The Yo-Yo Loach has a silvery to yellowish body color with dark vertical bands. Juveniles are more brightly colored, and because of the obvious pattern of ‘Y’s and ‘O’s along the fish’s side, the tern Yo-Yo was coined. The juvenile body markings in this species can be extremely variable, but as the fish turn into adults, their body pattern fills in and becomes more reticulated, hence another one of their common names. Females are noticeably plumper than males and when gravid, can actually become extremely fat. Males can be identified by their slimmer body and redness around the barbels and mouth area. Botia almorhae are often kept in a group of 6 or more of their own species, or in a community aquarium with other peaceful to semi aggressive species. They are good community fish and mostly hide during the day, coming out in the evening to feed. They are generally peaceful but can hold their own with other aggressive species. Yo-Yo Loaches need a tank of at least 30 gallons with a sandy or extremely fine substrate, some plants, smooth river rocks, and driftwood for them to hide among, and plenty of swimming space. Because they prefer subdued lighting, some floating plants can be added to the tank to diffuse the lighting and for cover. These botias are excellent diggers and because of their delicate barbels, should definitely have a sandy substrate in their tank. Because these loaches do jump at times, a tightly fitting cover is also essential. The Yo-Yo Loach does best in well oxygenated water with some degree of current. They are intolerant to the accumulation of organic wastes and require spotless water conditions to thrive, so a quality canister filter is recommended for this species. For this reason, they should only be introduced into stable, biologically mature aquariums. Weekly 30% to 50% water changes are recommended. 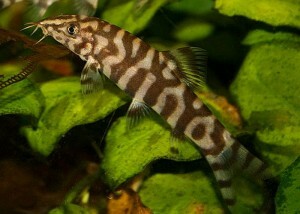 Although mature females regularly fill up with spawn, no successful spawning of the Yo-Yo Loach has been recorded in an aquarium environment. In their natural environment, Yo-Yo Loaches are chiefly carnivorous but will eat vegetative matter when available. Their natural diet consists of insects, worms, aquatic mollusks, and other invertebrates. In an aquarium environment, they are not fussy eaters and will eagerly accept a quality flake or pellet food, live or frozen bloodworms, tubifex , brine shrimp, and occasional offerings of fresh fruit and vegetables like melons, cucumber, blanched spinach, etc. Chopped earthworms can be offered as a “treat” but only sparingly. This species will also rid your tank of unwanted pond snails which they relish with gusto. The Yoyo Loach or Pakistani Loach is usually available to tropical fish keeping enthusiasts online and in pet stores when they are 1 1/2″ to 3″ in length at a moderate cost.